Progressive Charlestown: Put down that Twizzler®! Black licorice. You either love it – or you hate it. But one Western researcher is offering a reason to pass the next time you think about reaching for that black licorice jelly bean, twist or whip – your health. Dr. Stan Van Uum, a professor in the divisions of Clinical Pharmacology and Endocrinology and Metabolism, warns that binge eating the popular confectionary can send your blood pressure soaring, as well as cause dramatically lower levels of potassium in the body, resulting in abnormal heart rhythms and even paralysis. The problems are compounded, he continued, because most Canadian physicians don’t know to ask about it. Hypertension (high blood pressure) is one of the most common problems encountered in the primary-care setting. Numerous secondary causes of hypertension exist and most are potentially reversible. The ability to screen and manage such causes may spare patients from prolonged medical therapy and complications. Van Uum cited the case of a sweet-toothed 51-year-old patient who recently presented himself in the emergency room with complaints of abdominal pain for three days, plus a day of decreased appetite, vomiting and diarrhea. His elevated blood pressure and hypokalemia (low potassium) led doctors to run a series of tests. Upon further questioning, doctors discovered the patient had recently started eating large amounts of black licorice jelly beans – about 50 a day – which he continued to eat while in hospital. That was all the information doctors needed. “Most people wouldn’t think about it. Patients wouldn’t think of mentioning it. They don’t see it as an issue,” Van Uum said of the case study he recently co-authored in the journal Postgraduate Medicine. Glycyrrhetinic acid – the active ingredient in licorice – is the root cause of the problem, through its effects on the body’s cortisol metabolism, taking away a protective mechanism, Van Uum explained. Licorice causes your body to retain water and salt, therefore lowering potassium levels. An enzyme in the body acts as a gatekeeper, with the cortisol on one side and a receptor on the other, not allowing the cortisol to get through because it’s continuously inactivated. But licorice stops that inactivation, allowing the cortisol to pass through. So, how often would doctors see a case such as this? It depends on what country you’re in. “In the Netherlands, it’s the second or third question the doctor would ask if a patient is showing signs of high blood pressure. It’s very common and familiar to them,” Van Uum said of the popular Dutch candy. “Same goes for some other Scandinavian countries, as well. Much of the black licorice sold in the United States, however, isn’t dangerous at all as it does not contain actual licorice. 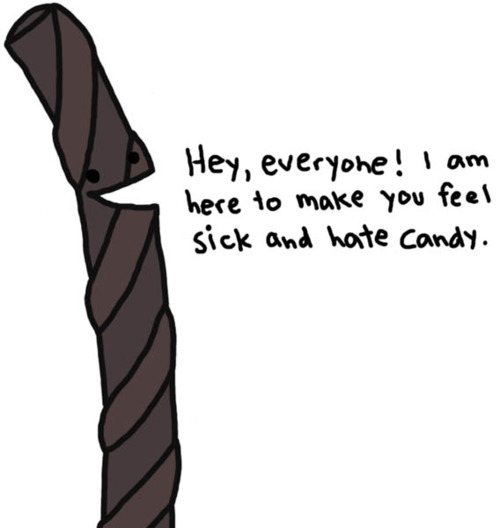 Instead, manufacturers add anise to the candy to give it a licorice-like flavor. In a similar case, another patient saw his blood pressure soar in January and February, then drop back to normal by March. It happened again the following year. His doctors’ inquiry discovered the patient was receiving an annual Christmas package filled with, you guessed it, black licorice treats. “It’s again something that, if you are not aware of, you don’t find out,” said Van Uum, who knows of a patient in the Netherlands whose licorice consumption led to temporary paralysis. That said, Van Uum stressed you don’t need to cut out the tasty treats together. The effects on the body depend on the amount of licorice eaten and the patient’s sensitivity to the ingredient. There are also products – such as chewing tobacco, smoking cessation aids, teas and even cheeses – that contain licorice, so it is important for physicians to ask for, and patients to share, detailed dietary histories in the workup of hypertension. Patients may not be aware or properly informed of the potential side effects of licorice and are unlikely to list it among their medication, Van Uum noted. “If you find someone who has a certain increase in blood pressure, and a relatively young person, because blood pressure goes up with age, if its severity is more than you expect, you need blood tests to further check,” he said. Had the licorice diagnosis not been made with the 51-year-old patient, he would have likely gone on a number of medications to treat his symptoms, which themselves could have had potential side effects. And the jelly bean binging likely would have continued.